UCS | Sachin Chandra - Universal Consulting Services Inc.
As UCS’s Vice President of Technology and Business Solutions, Sachin Chandra is responsible for capture and delivery of enterprise business and IT initiatives for new and existing customers. He focuses on technology support and solutions development across various business domains including financial, contracting, and health services. 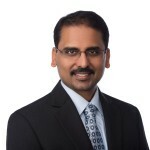 Sachin brings a deep commitment to customer delivery through innovative approaches and over 25 years of management and technology consulting experience with commercial and federal clients. His strengths include an ability to quickly understand business or execution challenges. In his role, he drives the implementation of appropriate management approaches and technology solutions including IT infrastructure, operations, application development, business intelligence, cloud computing, open source, big data, workflow automation, systems integration, and implementation. Prior to joining UCS, Sachin held senior technology and management leadership positions with large, billion-dollar corporations such as CGI-AMS and Tata Consulting. Sachin holds an M.S. in Information Systems from George Mason University and a B.S. in Computer Science from Birla Institute of Technology and Science, India.